New 3D model showing the right angle connectors and the updated “Servo” that now is renamed to 32 x IO Hat. I have done some mechanical changes and added a lot of protection electronics. As mentioned earlier this is my test ground for the VM and each channel have multiple capabilities – hence the “IO” rather than Servo. I do in addition have the 7 x Stepper, but I am not happy with the connectors on that one. 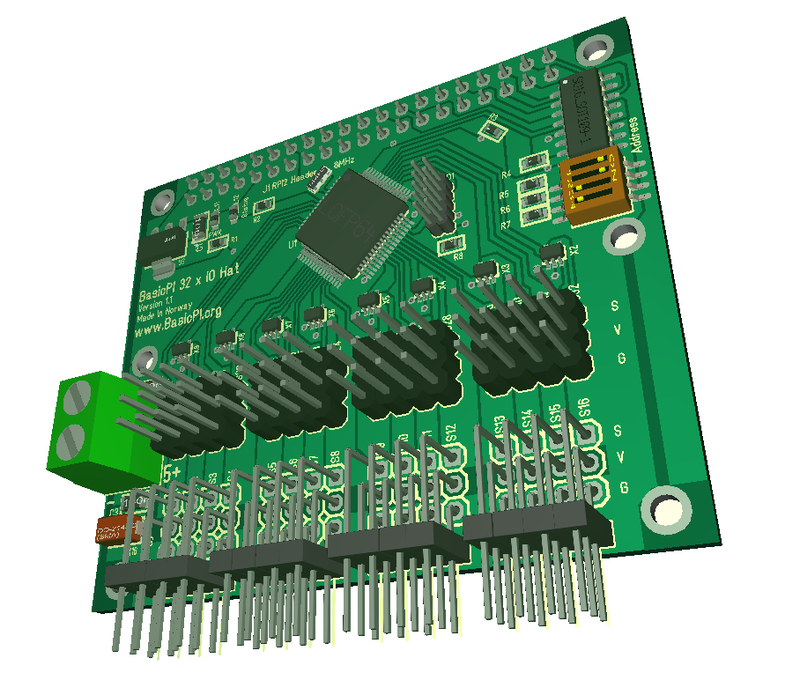 The 28BYJ-48 stepper motors comes with a 5-pin connector that is nice and exist as right-angle, but I can only manage 3 of these in stacked position – To be honest I am considering ditching this Hat design. As we move forward I will add more hat’s and more distributed sensors and controllers to allow larger and more complex systems to be created. I want to create a few robots + I want to automate my home for the fun of it. But, all of this is worthless without an easier way to apply Distributed logic so I will continue to dig into the PLAIN concept for now. I did earlier create named Event’s that could be called with a Raise statement. The last example created an Event digitalIn where the “name” is a declared object register and the event is automatically called if C or PLAIN assembly changes that exact bit. I like the concept, of Automatic events, but I need to let the syntax mature a little. Is this event to be called before or after we change the bit? Is it to be called only on Write or also on Read? And what about parameters? The modified syntax above name the event to enable it to be raised or called, and it add the On keyword to allow allocation of automatic events. This add the syntax After|Before Read|Write allowing us to control how it is called. Adding parameters is also straight forward since we have a name and a (). Parameters will either be the same as declared in the C implementation or none at all – need to work on this part. The event above is however a challenge because it is connected to an ADC that very well might be sampled at 2.4Mhz. Any attempt on calling an event at that frequency will overload our MCU, so we need a buffer mechanism if we actually want to sample this fast, or add a filter on the ADC. A filter in this case is a max frequency and a threshold requiring a minimum change before it is raised as an event. These capabilities needs to be added to the C interface – I don’t think I want to control this on the Event declaration – not sure. This example assumes that object “Channel” and C bindings are declared in lib32io that is part of the repository. This will work, but I need the assembler to be smart since lib32io will declare more content than we want to include on this module, so everything that is not used will be removed by the assembler to keep both module and object mapping at a minimum. Servo with a 14 bit pulse resolution. PWM out with 14 bit resolution. This is a bit-banged PWM that can be used on all channels. This firmware is an excellent test-ground because it includes highly programmable logic and a hard real-time core on the bit-banging part. In this example I force Ch1 to be located at Register 0x8010. The more tricky part is the integration with C/C++ code. The challenge is that the module and data we transfer must match what the C/C++ firmware expects. This last mapping is done by the real-time linker in the firmware that receive the above as a “PLAIN Module Specification”. If it fail it will need to reject the module. In theory it should never fail as the assembler should stop us, but it is always the possibility of firmware version mismatch. This part will need to be strict or we will just dig into loads of debug problems. This example configure Ch1 as a Servo and Ch2, Ch3 as digital input pins. The Map statements link the objects to associated C/C++ code. The Assembler (and real-time linker) will check these exact names and parameters – parameters must match on name and data type. The Event statement “digitalIn” declare that any change to bit 2 in the digitalIn will cause a call to this bit of logic. This will be called regardless if it is C/C++ or PLAIN assembly that makes the change. I think this will work, but I need to let it mature to catch up missing bits and see if I can optimize this. Notice that while this example is ca 40 lines in assembly we would be talking about ca 7 instructions in the resulting code (+ initialization). The initialization will in this case be nothing since 0 is the default value on all registers. The VM will automatically reset this before execution to avoid that we have random, default values. “Event digitalIn” will generate 2 instructions – an Assign and a Return. But, keep in mind that this draft is work in progress. I will implement this next to see how it actually works out in real life. 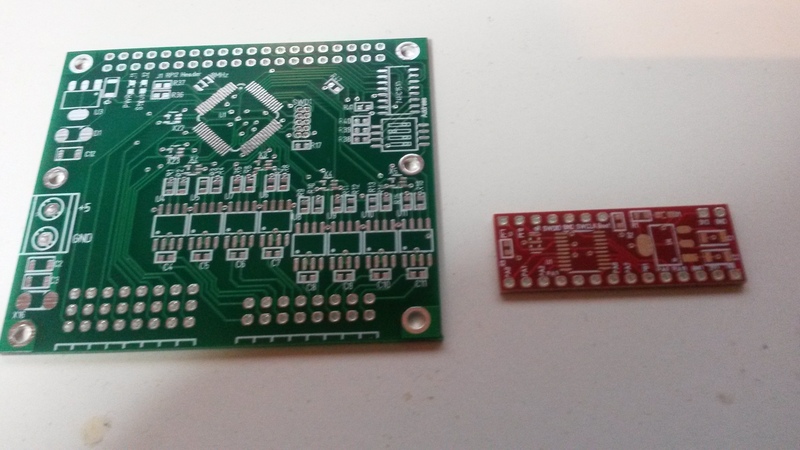 Two new PCB’s arrived. The large green is another Hat – the 8xDC Motor Driver. The small red one is the STM32F030F4 breakout. I am using www.Elecrow.com on all my PCB’s because they have proven to be very reliable. 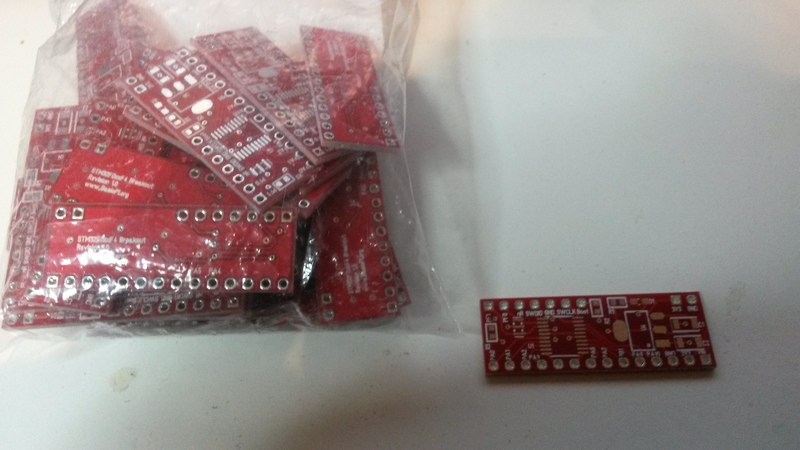 I ordered 10 of these small PCB’s and well – the bag contains 40 – and the PCB quality is good. I will get Down to testing these Boards in due time. Wrapping up the VM I question some of the instructions so I reviewed the list once more. I will needed to add more of the If instructions back. I will probably also need to add bit operators later – I actually need to wrap up the VM and Write some actual code to see if miss something. Raise Raise an event. The same as calling a function without creating a stack Return entry. Call Call a function and create a stack Return entry. A function can be PLAIN or C/C++ function. Ifeq, Ifneq, Ifgt, Ifls, Ifgte, Iflse If statements. If takes an Expression and insert a Assign instruction to evaluate the Expression. All other compare two registers. I hope to have a working demo of the VM in a few days. We have so far demonstrated PLAIN Assembly with little difference to an actual 3.gen language. We will see the low-level assembly – instruction by instruction – a bit more as we dig into math and expressions. This would actually be slow in a VM since we are an interpreter, but also to close to a native assembly language for my taste. The result I want to try out is a horse trade – I accept that my IF statement use 2 instructions and create a new instruction dedicated to calculate Math and boolean expressions. This would be the actual assembly, but I am happy to let the assembler insert Assign statements in advance of If, Call and Raise as needed as a trade-off. The assign instruction is dedicated to calculate math expressions written in a natural, readable format. The assembler will parse the expression and build a math table that in run-time calculate the expression that is stored in R1 – the math table is the 2nd parameter in the Assign instruction. We will still need to interpret the Math table, but as this now is dedicated for Math I can also do tricks to optimize speed. But, Math and Expressions are a VM’s weakest link with regards to performance. PLAIN VM consist of multiple Modules. A Module have it’s own unique name, easyIPC Object map, Stack and can execute independently from other Modules. One Module can interact with other Modules or call them on blocking/non-blocking schemes. In this last example we just add our code to a global module. As we assemble this we also declare what repository to use, and the use statement administrate what modules we access. This is designed to be easy once set up, but still give you full control of what the assembler does and how it assemble Your modules. It also enables portability by replacing the repository – no changes to Assembly code. A repository is a XML based database that we need to write. This describe the VM, add-on modules in C/C++ and PLAIN etc. “use System” assume we have a module named “System” with an exact description of this. Your object file will contain this as a “specification” that is downloaded with your module. The real-time linker will reject modules with missing dependencies. Events and state engine support is a key feature in PLAIN where we do things different. It basically convert the entire application into a state engine where processing is top-down based on events. I am not sure how much of this I want to support directly in the VM, but I will Experiment a bit. An Event is basically a function that needs to be called with a Raise statement. But, unlike a Call it will not return and instructions after “Raise” is illegal as they never will be executed since we will return to the last Call. Options are Static, Mandatory, Optional. A static event can not be overridden. A mandatory event must be overridden. An optional event (default) can be overridden by the choice of the developer. The keyword Event is only legal on the end of a function where it also “end” the previous function/event body or after a Call where it will catch mandatory and optional events. One important feature about event is the “do nothing” rule – if an event is raised and not caught nothing should happen. The Assembler should generate an error, but the VM should execute the Raise and behave as if it was Raise Continue. Events have so far only been a mechanism in the high level language, but I want to support it in the assembly. Events are as mentioned return conditions. We create functions with multiple exit paths where each exit is a “return” with its own event code and separate list of return parameters. To enable this we need a “Raise” statement, but we also need a “Event” to catch this in the calling code. In this example we call “MyFunc” that Raise MyFunc2 that again Raise Error. The returning event will in this case be Error. Raise behaves like a Call, but do not create a return entry on the stack. A call creates a stack return entry causing processing to continue with the next instruction – raise preserve the existing stack entry. If a function reaches End without raising an event that is the same as “Raise Continue” that can be processed with “Event Continue”. The Event statement in the function declare the event and its parameters.